This practice keyboard has the serial number 8372 and was built in 1913 by Almon Kincaid Virgil. It has weighted keys and the resistance can be adjusted by turning the brass knob above the center of the keys. No musical tones are produced. These were especially in demand for professional pianists who spent most of their time on a train. Virgil also had a study method book series that was very popular and was written to be used with the Practice Clavier. It was first introduced in 1884 and was made until about 1920. While the very first electric pianos were built in Germany, Story & Clark was the first to build them in the USA, starting in 1939, the year this piano was built. The bottom board has a wicker type speaker cloth with speakers behind them. The decal reads “Storytone” and in smaller letters below, “Voiced by RCA Victor”. The piano is 36″ high and has no soundboard, but uses electric pickups and, of course, an amplifier. 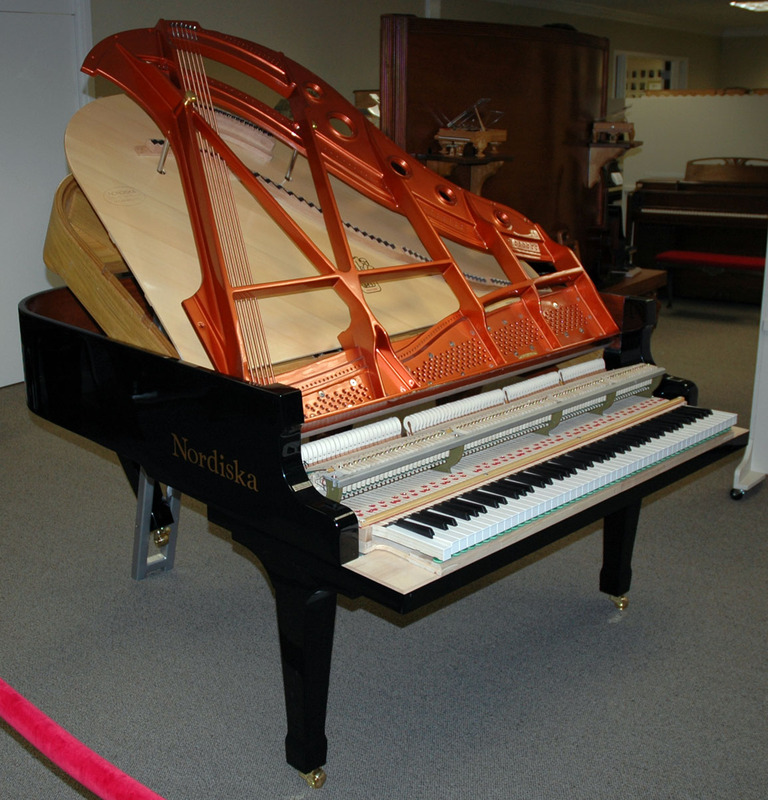 The serial number is 756751 and was purchased by the Piano Technicians Guild Foundation. 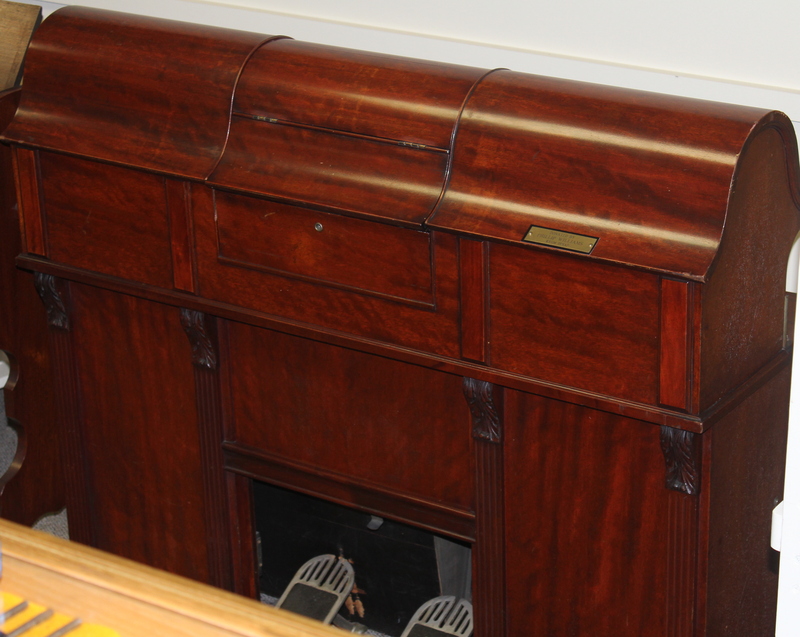 This Pianola piano-player unit was built by Aeolian in 1908. The piano-player preceded the player piano, but was the start of the trend that reinvigorated, or some would say saved, the piano industry. This unit contains no piano or piano parts. It is pushed up in front of a normal piano, a person would sit in front of this and insert the paper roll, pump the pedals, and adjust the expression controls for the piano to play. The Pianola has felt covered fingers that press down the piano keys. 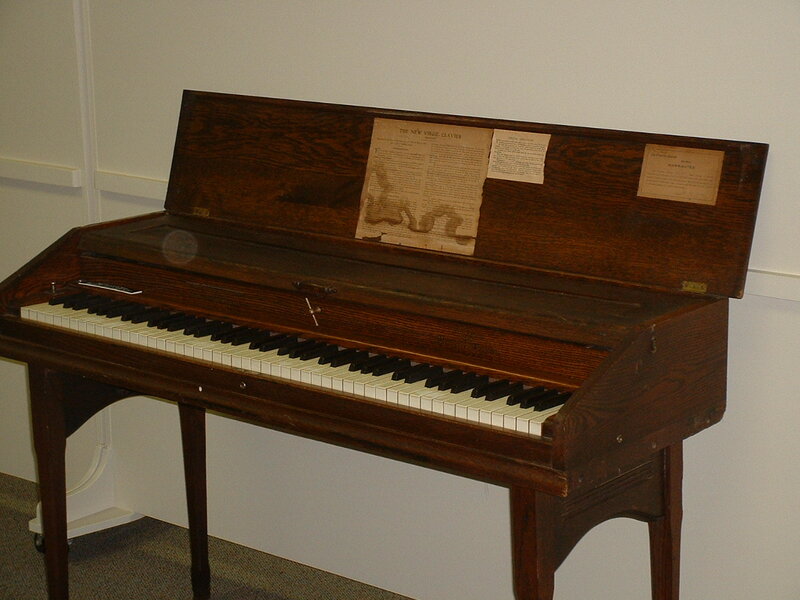 The Pianola was invented and patented by Edwin Scott Votey, who built the first one in Detroit, Michigan in 1895. Aeolian had the first Pianolas for sale in 1898. The name Pianola was taken by the public to be a generic name when other companies built similar units. Later, when Aeolian started building player pianos with the playing mechanism inside of the piano case, they kept using the name Pianola, because it was so well known. Showing an exploded view of how a piano is constructed, this piano was built for showroom display, but is an excellent tool for teaching the uninitiated what goes into building a modern piano. This was made for Nordiska, originally a Swedish piano maker, in China by the DongBei Piano Group in 2009. We thank Steve Pearson, RPT for this generous donation. It can be seen in more detail here.